They came to South Africa in search of a better life and, for a while, found the promised land. Fungai Chopo got work as a builder, his wife, Memory, was hired as a maid, and they shared a decent house with their two children. The hunger, joblessness and poverty of their home in Zimbabwe was banished. This week all that changed for the Chopos and for many like them. One night just before midnight about 15 men burst into the family home, clubbed Fungai until he bled, threatened to kill the family and stole all they had, including the HIV medication that keeps Memory alive. 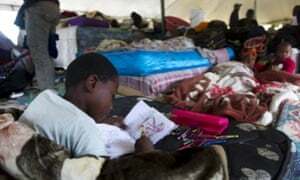 Now the Chopos are among roughly 3,500 immigrants sleeping rough in crowded tents in heavily guarded transit camps not in a Congolese or South Sudanese warzone but in 21st-century South Africa. Foreigners have fled for safety from a recent eruption of xenophobic violence in which at least five people have died, shops have been looted and torched, and South Africa’s reputation as a haven of tolerance for the tired, the poor, the huddled masses of a turbulent continent has been shaken. “The fabric of the nation is splitting at the seams; its precious nucleus – our moral core – is being ruptured,” the Desmond and Leah Tutu Legacy Foundation said this week. The Chopo family fled to a transit camp erected just over a week ago off Florence Nightingale Road in the suburb of Chatsworth. By Thursday it was offering sanctuary to about 1,200 immigrants, with eight tents in an area roughly the size of a football pitch, surrounded by armed guards and steel crowd-control fencing draped with drying blankets and clothes. There was a hubbub of voices as people formed orderly queues to register or take a lunch of bread and beans provided free by volunteers. Litter was strewn on the grass that turned muddy as rain fell. South Africa is to many Africans what America represents to many around the world: an escape, a fresh start, a land of opportunity. When gold was discovered in Johannesburg in 1886, it was soon being mined by men from a dozen African nations. Today the country is a magnet for Congolese, Ethiopians, Malawians, Mozambicans, Nigerians, Somalis, Zimbabweans and others fleeing conflict or seeking to improve their lot. Estimates of immigrant numbers vary from 2 million to 5 million, out of a population of 51 million. But the recent wave of xenophobia has tarnished this image and fuelled resentment among those who accuse South Africa of an arrogant exceptionalism that looks down on the rest of the continent. 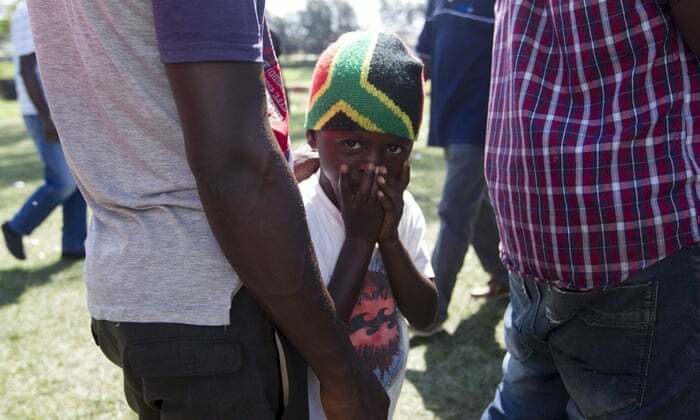 On Thursday Manhica was among about 100 Mozambicans who, in a stark image that few thought they would see in democratic South Africa, boarded a coach for home because their safety could no longer be guaranteed. He had lived here for 13 years was leaving behind a South African wife and child. “I came here for work to pursue a better life for myself and my family,” he explained. “I got a small business, but it has all stopped since the attacks began. Searching for an explanation, analysts point to South Africa’s status as one the most unequal societies in the world, the violent legacy of racial apartheid and an unemployment rate recorded officially as one in four, and reckoned to be more accurately one in three. There have been frequent explosions of xenophobic violence over the past decade, notably in 2008 when 62 people, including 21 South Africans, were killed and more than 150,000 displaced. Ingrid Palmary, associate professor at the Wits University African Centre for Migration and Society, cited a lack of faith in state institutions, easy access to handguns and a perception that foreigners are to blame for hardship. “It takes a small trigger to spark a deep level hostility,” she said. In Durban’s impoverished Bottle Brush informal settlement, brick homes sit alongside shacks fashioned from metal sheets, wood planks and chipboard behind fences topped by razor wire. 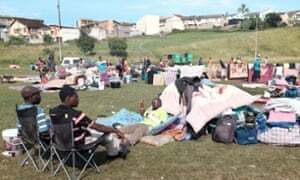 Foreign nationals were chased out last week and few residents were willing to talk, but Nana Mkhonde, 29, was frank: “Our citizens took action because they wouldn’t leave and they were being told they must leave. They came with nothing, they can go with nothing as well. I feel bad because they left crying, but we have no choice. The Zulu king, Goodwill Zwelithini, stoked the fires by calling for foreigners to pack their bags and leave, while the government is still wrestling with how to define the problem. The police minister, Nathi Nhleko, described the attacks as examples of “Afrophobia”, not xenophobia. “What you don’t see is you don’t see Australians being chased on the streets, Britons being chased on the streets and similar demands being placed on them that they should be leave the country and so on,” he said. But such comments have been met with scorn. Bishop Paul Verryn, who for years gave shelter to thousands of migrants at Johannesburg’s Central Methodist church, said: “It’s semantics in the face of disaster. It’s eating cake while the world goes hungry. There’s been a thunderous absence of good leadership. Posted on 17th April 2015 by newsafrica. This entry was posted in Africa, Mandela, South Africa, Xenophobia and tagged Africa, Durban, Jacob Zuma, Johannesburg, KwaZulu-Natal, Robert Mugabe, South Africa, Xenophobia, Zimbabwe, Zimbabwe African National Union – Patriotic Front. Bookmark the permalink.